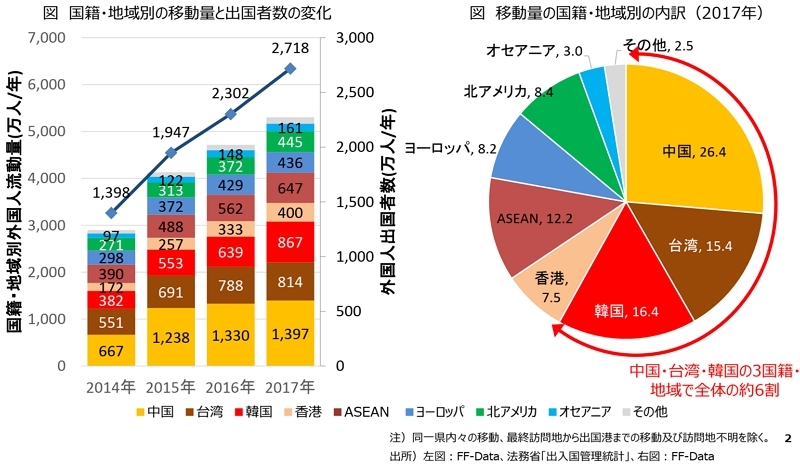 FF-Date or Flow of Foreigners-Data in 2017, announced by Ministry of Land, Infrastructure, Transport and Tourism, finds that traffics of international visitors in Japan increased for three years in a row, and traffics of visitors from China, Taiwan and South Korea accounted for about 60% of the total. FF-Date analyzes traffic among prefectures, visitors into prefectures, nationalities, used transportations, touring routes, guest nights, gateway airports and so forth. The date is also combined with the spending trend survey by Japan Tourism Agency and international air traffic survey by Civil Aviation Bureau. The graph below shows traffics in Japan by nationality. 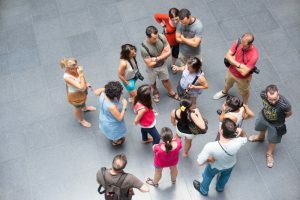 The total reached 50 million travelers in 2017. 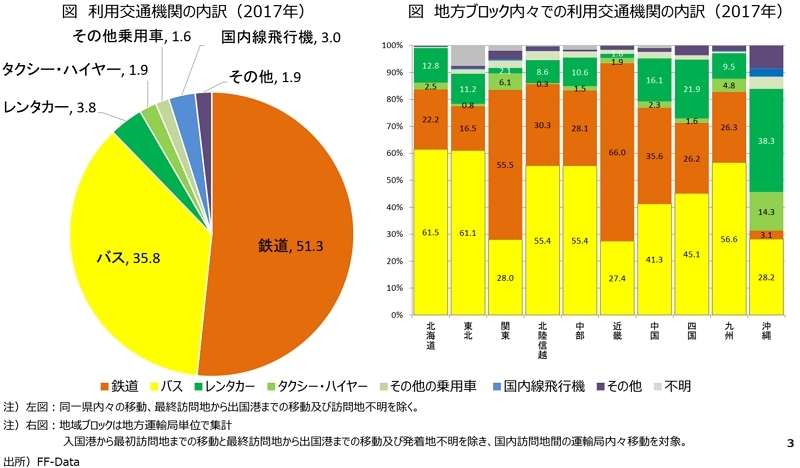 As the graph below shows, the most-used transportation in traveling in Japan was railway (51.3%), followed by bus (35.8%), rent-a-car (3.8%) and domestic flight (3.0%). In Okinawa, however, the most-used transportation was rent-a-car (38.3%). In Kanto and Kinki, the ratio of railway was about 60%, and in Hokkaido, Kyushu and Tohoku, the ratio of bus reached 60%. As far as the date in Kyushu is concerned, traffic between Fukuoka and Oita largely grew in 2017. 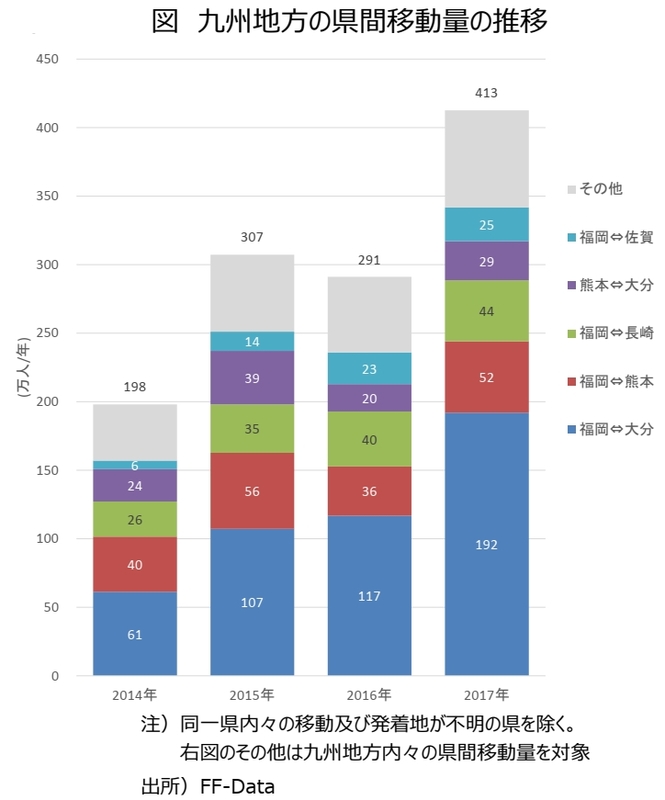 Also, traffics between Fukuoka and Kumamoto and between Kumamoto and Oita increased, which illustrated that traveler demand recovered in 2017 from the reduction after the Kumamoto Earthquake in April 2016.